Please join Oscar and all our accomplished readers for Line Break #20, Saturday, July 7, 3:00 p.m. at Q.E.D. in Astoria. Tickets are only 7 bucks! Happy 4th of July, Line Breakers! On this auspicious day, we're delighted to announce the return of a very special guest. 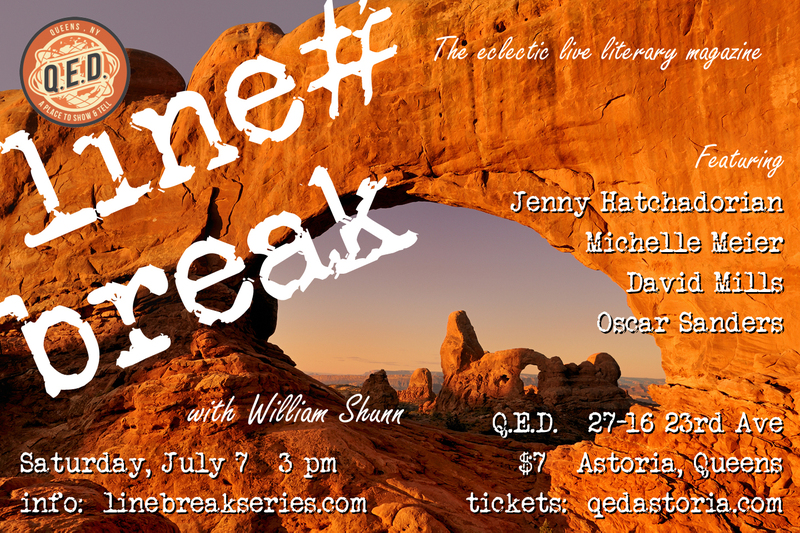 Please join David and all our accomplished readers for Line Break #20, Saturday, July 7, 3:00 p.m. at Q.E.D. in Astoria. Tickets are only 7 bucks! Michelle Meier is the author of Famous Geranium (Nauset Press, 2015), a full-length collection of poems. She is the recipient of a fellowship at Saltonstall and her work has appeared in The Rumpus, Radar Poetry, POOL Poetry, The Dialogist, and elsewhere. Michelle is the Art Editor and Associate Poetry Editor of Foundry Journal. She teaches in the art department of a public high school and lives in New York. 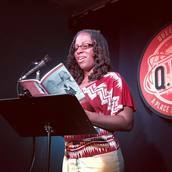 Please join Michelle and all our spectacular readers for Line Break #20, Saturday, July 7, 3:00 p.m. at Q.E.D. in Astoria. Tickets are only 7 bucks! 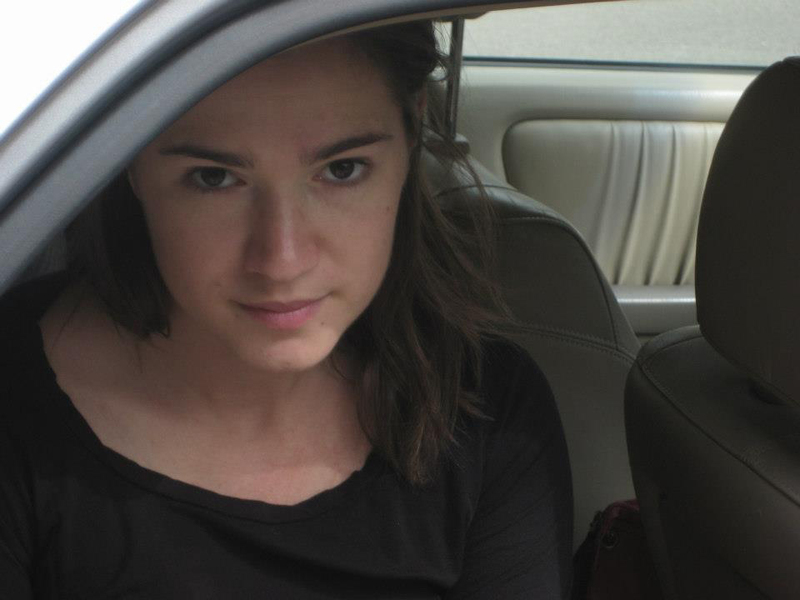 Jenny Hatchadorian was an award-winning filmmaker before turning to comedic essays. Her film Present Company Excluded is on Amazon Prime and on other streaming platforms worldwide. Her essays can be found at Story Club Magazine and on the podcast Everything Good. 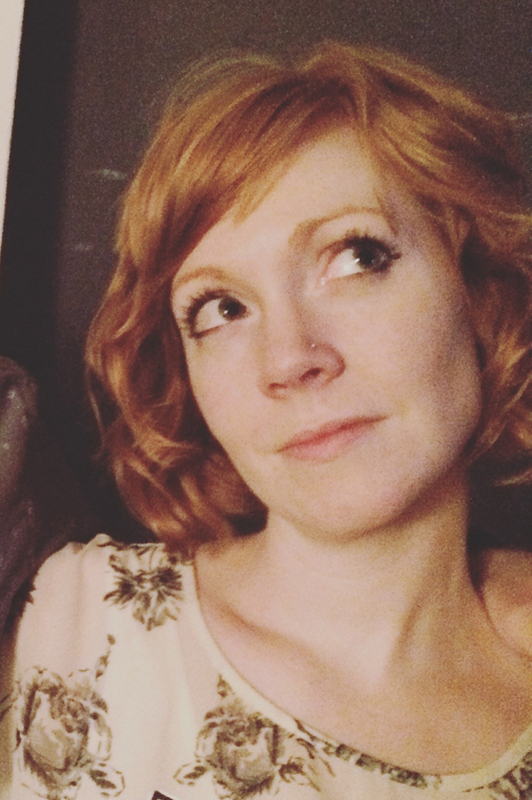 Her essay "New Family" won Story Club Cleveland's Audience Award in 2017. She is working on a book of essays. Follow her on Instagram at @jennyhatchadorian. 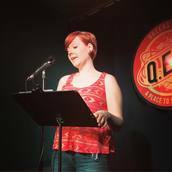 Please join Jenny and all our outstanding readers for Line Break #20, Saturday, July 7, 3:00 p.m. at Q.E.D. in Astoria. Tickets are only 7 bucks! Saturday, July 7, 2018, 3:00-4:30 p.m. Thanks for making Line Break #19 the best Line Break yet! A gigantic thanks to everyone who turned out for our nineteenth regular episode of Line Break this past Saturday, at beautiful Q.E.D. in Astoria, Queens. Just by showing up and giving us the gift of your attention, you helped make the afternoon bigger and better than it would have been without you. Thanks as always to Q.E.D. for giving us the space and an opportunity to use it. And thanks especially to our amazing readers, who made it the fantastic show it turned out to be. 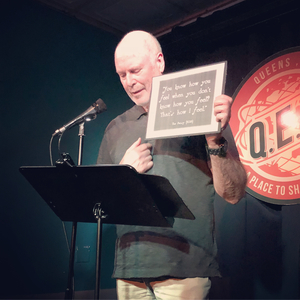 Emily Hockaday, Sherese Francis, and Kurt Olsson brought us stunning poetry, Michael Libling delighted us with an excerpt (and intertitles!) from his forthcoming debut novel, Hollywood North. And Julie Threlkeld took us on a fascinating journey through the early days of Sigmund Freud, the paradoxes of the Winchester Mystery House, and the perils of psychotherapy. If you couldn't make it out on Saturday, please mark your calendar for Saturday, July 7th, when we'll we back with our twentieth issue featuring Jenny Hatchadorian, Michelle Meier, Oscar Sanders, and David Mills. We look forward to seeing you again in July! Until then please check out all the terrific shows and events at Q.E.D. There is something amazing happening there literally every day. Remember to leave extra time to get to Line Break today! 1. Our show today is at 5:00 pm, not the normal time. Doors open at 4:30, so try to be early. 2. There is no N train service today in Astoria! You will need to transfer to an N shuttle bus at Queensboro Plaza, then ride that to the end of the line. We would recommend adding an additional 30 minutes to your expected travel time. Reminder: Line Break #19 is this Saturday afternoon! TRANSIT NOTE: Q.E.D. is usually a short trip from Manhattan on the N train to AstoriaDitmars Blvd in Queens. However, planned construction will disrupt train service the weekend of June 2nd. Shuttle buses will run from Queensboro Plaza to AstoriaDitmars Blvd. Please leave yourself plenty of extra time for travel, at least thirty minutes to be safe. Saturday, June 2, 2018, 5:00-6:30 p.m. 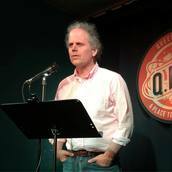 The Kurt Olsson reading on June 2 is the same who read at Line Break on January 6, 2018, except he's a bit grayer and, one hopes, warmer. Kurt Olsson has published two collections of poetry. 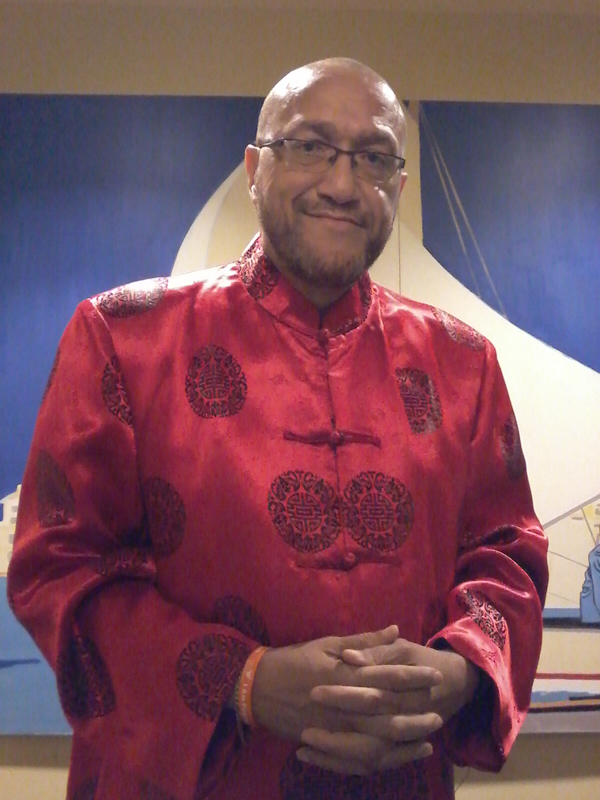 His most recent, Burning Down Disneyland (Gunpowder Press, 2017), was selected by Tom Lux as the winner of the 2016 Barry Spacks Poetry Prize. His first collection, What Kills What Kills Us (Silverfish Review Press, 2007), won the Gerald Cable Book Award. 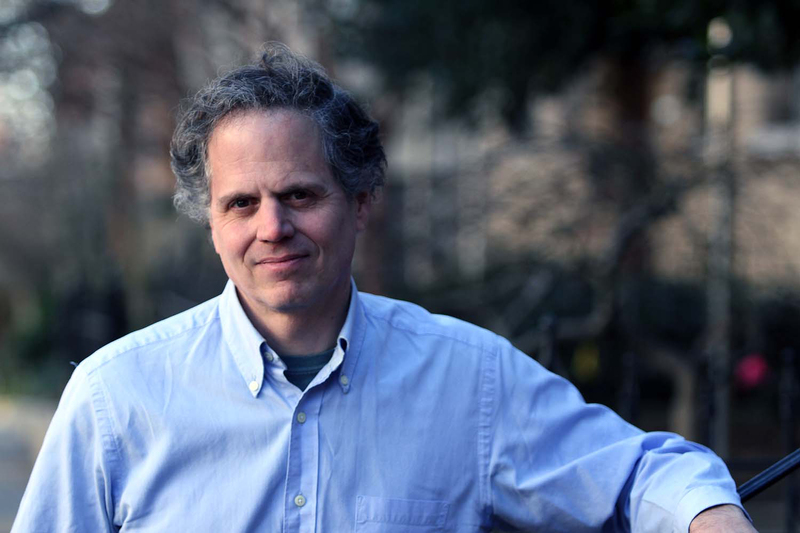 The book was subsequently awarded the Towson University Prize for Literature, given annually to the best book published the previous year by a Maryland writer, and named Best Poetry Book of 2008 by Peace Corps Writers. Kurt's poems have appeared in many journals, including Poetry, FIELD, The New Republic, Southern Review, Poet Lore, and Antioch Review. 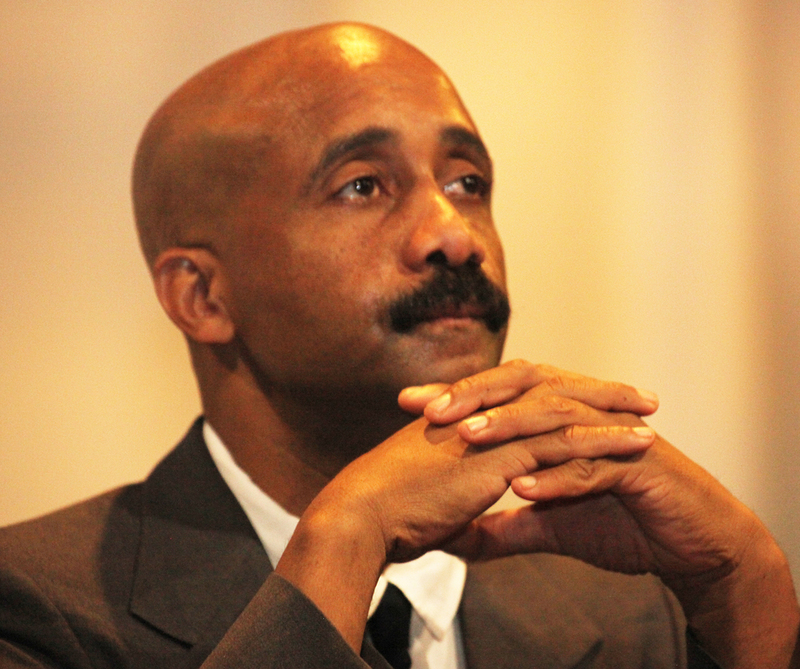 He lives and works in Bethesda, Maryland. 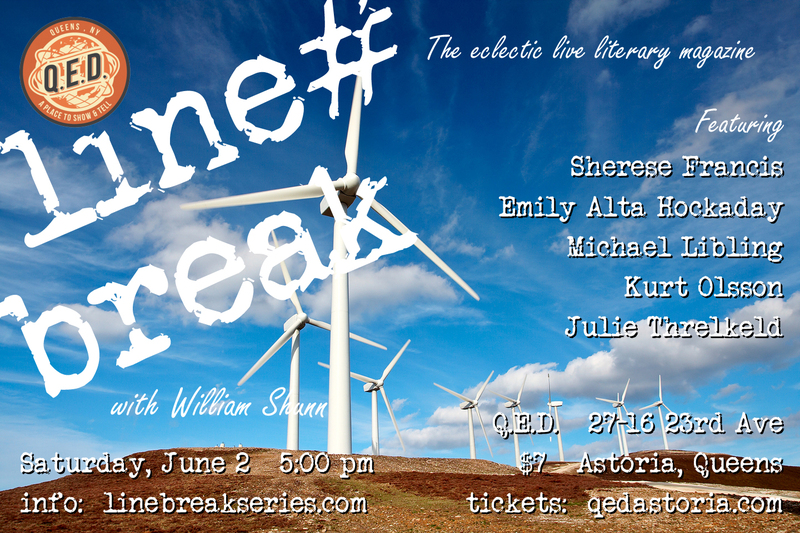 Please join Kurt and all our world-class readers for Line Break #19, Saturday, June 2, 5:00 p.m. at Q.E.D. in Astoria. Tickets are only 7 bucks! 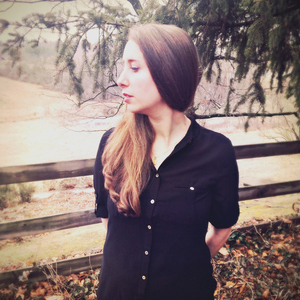 Emily Alta Hockaday is a poet and editor living in Queens. Her forthcoming chapbook, Beach Vocabulary, will be out with Red Bird Chapbooks later this year. She is author of three previous chapbooks: Ophelia: A Botanist's Guide, What We Love & Will Not Give Up, and Starting a Life. Her poetry can be found in a number of literary journals including the North American Review, Collapsar, Cosmonauts Avenue, and Newtown Literary. She can be found on the web at www.emilyhockaday.com and @E_Hockaday. 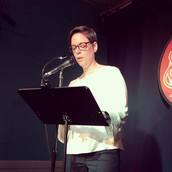 Please join Emily and all our incredible readers for Line Break #19, Saturday, June 2, 5:00 p.m. at Q.E.D. in Astoria. Tickets are only 7 bucks!